This is an area of interim borders and unsettled claims. While tensions have calmed since the last stand-off on the Doklam plateau, along the Line of Actual Control (LAC) which ended in August of last year, both sides are continuing to build up their ground forces in this inhospitable terrain. The plateau, which lies at a junction between China, the north-eastern Indian state of Sikkim and the Himalayan kingdom of Bhutan, is currently disputed between Beijing and Bhutan. India supports Bhutan's claim over it. US geopolitical intelligence company Stratfor's images focus on the accompanying build-up in air power to support these units. The Stratfor analysis looks at four critical air bases, two Chinese and two Indian, that are within range of the Doklam plateau. They say "the imagery confirms that both China and India are pursuing a wide-ranging strategic build-up that has only accelerated in the wake of the 27 August agreement". On the Indian side of the border, imagery of the Siliguri Bagdogra air base and the Hasimara air force station shows how India has moved to reinforce its air power close to the Doklam plateau. Siliguri Bagdogra normally hosts a transport helicopter unit while Hasimara was the base for MiG-27ML ground attack aircraft until they were retired at the end of 2017. Since the Doklam crisis of mid-2017, however, the Indian air force has greatly increased the deployment of Su-30MKI warplanes to these air bases as can be seen from the imagery. The Su-30MKI is India's premier fighter jet, and it will soon be capable of striking land targets with the advanced BrahMos cruise missile. On the Chinese Side, Stratfor says "an even greater level of activity is visible from imagery of the Chinese air bases near Lhasa and Shigatse. "This expansion may indicate a greater build-up by the Chinese," but Stratfor notes that "it could also reflect the more advanced facilities at these bases. Furthermore, unlike India, China's lack of air bases close to the LAC forces it to concentrate more of its air power at these airports". Imagery of the two air bases shows a significant presence of fighter aircraft (which Stratfor says peaked in October) and a notable increase in helicopters, as well as deployments of KJ-500 airborne early warning and command aircraft, components of the HQ-9 long-range surface-to-air missile system and Soar Dragon unmanned aerial vehicles at Shigatse Peace Airport. The Chinese made a number of major airfield upgrades at Shigatse immediately after the end of the crisis. A new runaway was constructed by mid-December, as well as other infrastructure improvements. 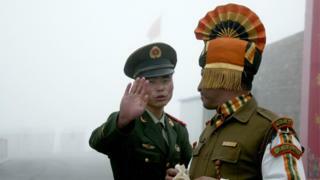 India and China have a long history of border tensions. India was defeated in a border war with China in 1962. There were armed clashes in 1967 and a prolonged stand-off during 1986 and 1987. Clearly the unresolved border issues are the immediate cause of these tensions. But other factors need to be looked at too, including the influence of nationalism in both countries as a mobilising force and the wider strategic competition between India and China as they both modernise and enhance their armed forces. So future conflict could erupt from an episode on the disputed border, but equally it could reflect the wider geo-strategic competition between these two aspiring powers. The Stratfor analysis concludes: "It is only a question of time until a new flashpoint along the LAC emerges, and as the increased activity shows, both sides will have greater capabilities to bring to bear" in any future crisis. What's behind the India-China border stand-off?